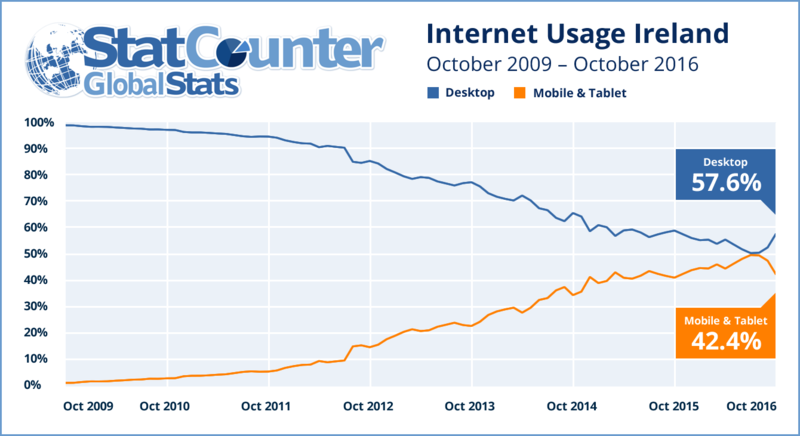 Internet usage by mobile and tablet devices exceeded desktop worldwide for the first time in October, source the independent web analytics company StatCounter based in Dublin. The figures show that 51.3% of internet usage worldwide in October was with a mobile or tablet, compared to 48.7% by desktop. Despite the rapid growth of mobile devices, desktop is still the primary mode of internet usage in Ireland with 57.6% and mobile and tablet use at 42.4%. When you look at the graphs above, it will not be long before it happens in Ireland. It’s a warning to local businesses looking to trade online they need to ensure their own mobile presence is fully optimised. And if the stats weren't enough, remember Google considers mobile-friendliness as a very important ranking factor for websites in local search.